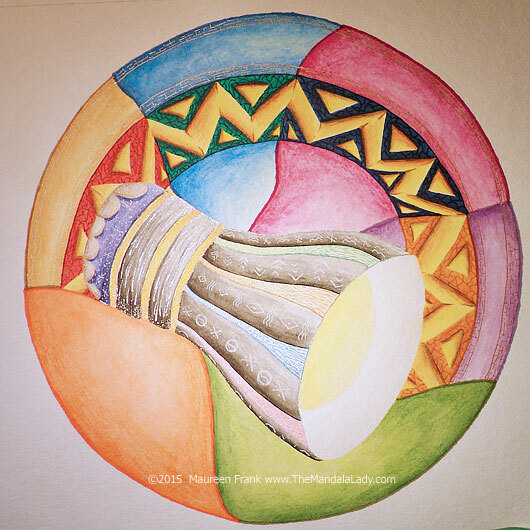 I’m continuing to paint the March 2014 Mandala of the Month, Consciousness. This post displays my progress on day 6 (12/18/2014) and day 7 (1/5/2015). For day 6, I mostly used watercolor pencils (Derwent Inktense). For day 7, I used with w/c pencils along with adding details with markers (Letraset Pro Markers , Tombows ) and gel pens (Sakura Gelly Roll , Yasutomo Gel Xtreme, Pentel Slicci ).